Come discover the charm of an old fashioned Country Festival at The Creekside Festival at Princess Place Preserve in Palm Coast, Florida the second Saturday of October every year. 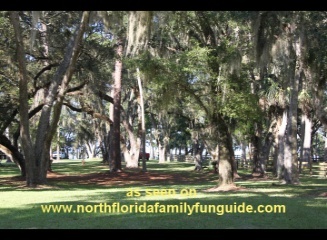 Bluegrass, country and folk music, fill the air while families enjoy the day away under the canopy of Live Oak trees. There is an amazing variety of local food vendors serving up their favorites, like barbecue, seafood, salads and sandwiches for the lighter fare, amazing Greek food, and even alligator on a stick! Visitors can shop the many arts and craft booths, and kids can have fun in the children's area, which has a bouncy house, paint your own pumpkin booth, pony rides, and other games and prizes. I loved the Mine your own treasure booth for kids, where they sifted through sand in the pretend goldrush "river" and discovered some interesting shiny rocks to keep! I loved the impromptu music jam on the back porch of the Princess house overlooking Pellicer Creek.